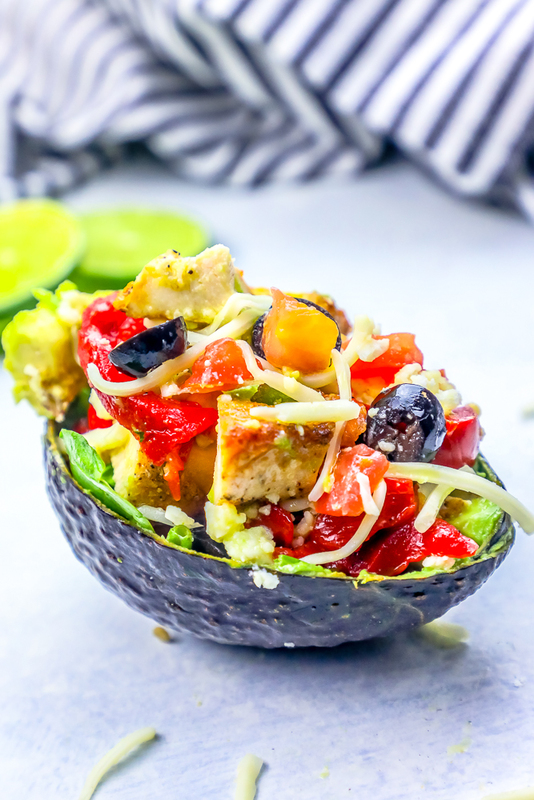 Quick, delicious and easy Cheesy Chicken Taco Salad Stuffed Avocado Recipe is the perfect hearty low carb lunch or dinner that is bursting with cheesy chicken taco flavor! 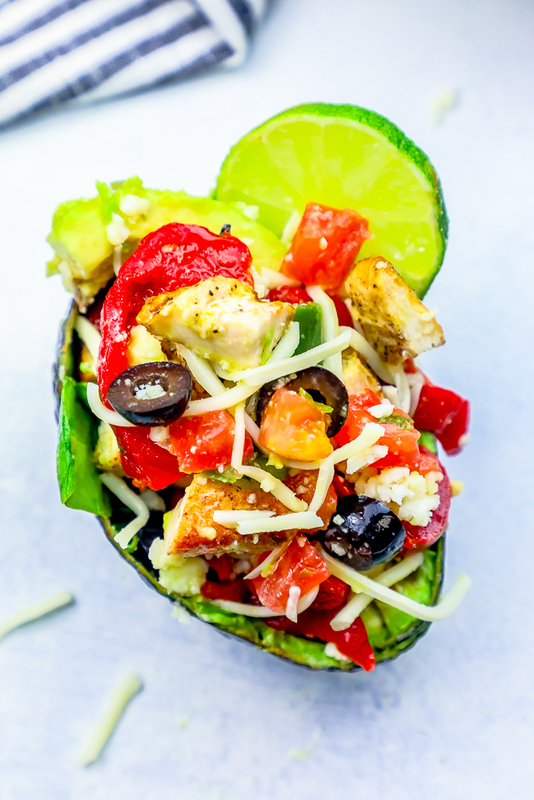 If you’re looking for a delicious, filling, and naturally low carb meal that is packed with flavor – I have your next favorite obsession – Cheesy Chicken Taco Stuffed Avocados. 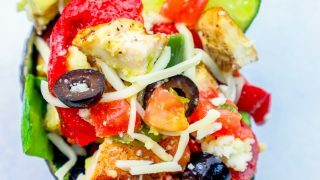 This recipe is simple, fresh, and bursting with bright colors and tons of flavor to help keep you full all day, and on track with your healthy eating goals. 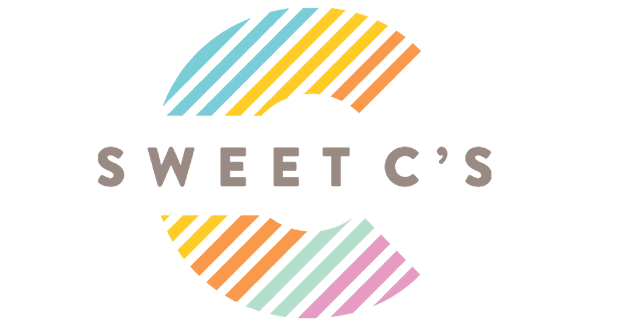 Plus it’s great for meal prep, so you can take it to work with you or serve at a dinner party or picnic on the go. 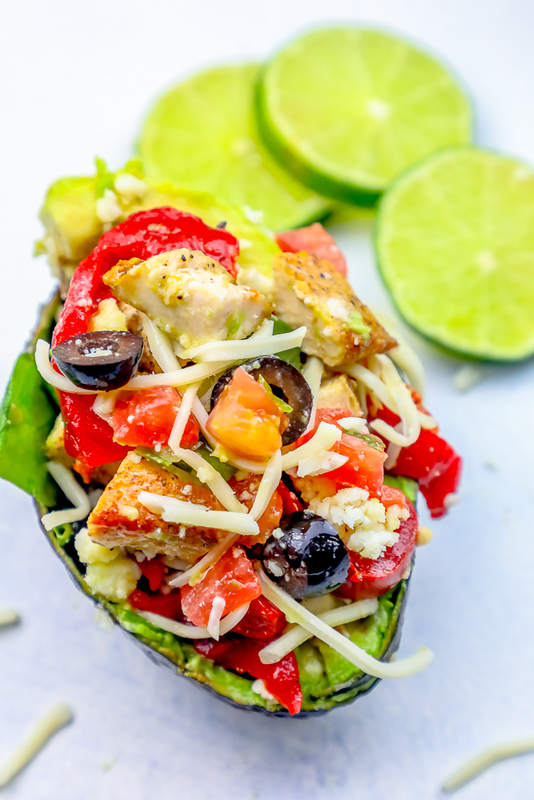 These chicken taco stuffed avocados are bursting with flavor and so easy to make – plus you can always use leftover chicken fajitas or tacos in this recipe the next day! 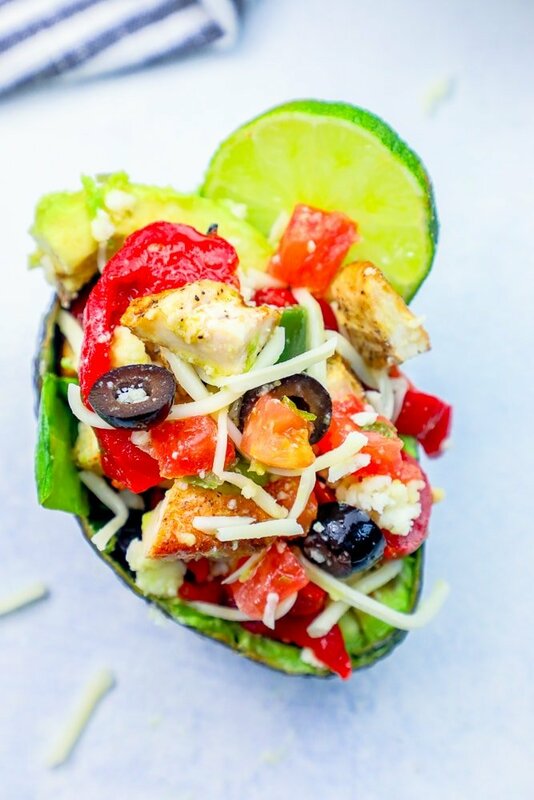 JUST TAKE ME TO THE CHEESY CHICKEN TACO STUFFED AVOCADOS RECIPE EVER ALREADY! 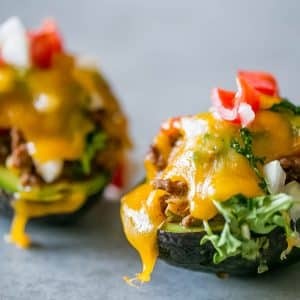 If you’d rather skip my (very helpful, i think) tips and tricks, essential cooking info, and similar recipe ideas – and get straight to this delicious easy cheesy chicken taco stuffed avocados recipe – simply scroll to the bottom of the page where you can find the printable recipe card. 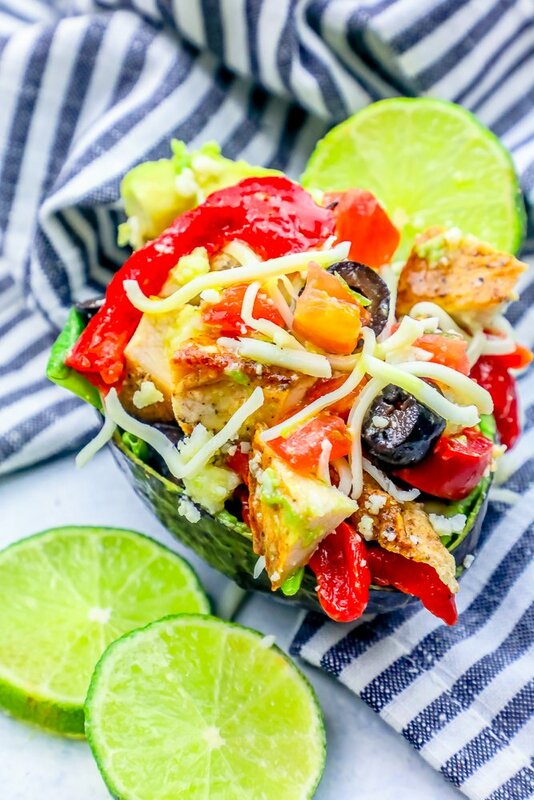 If you love this Cheesy Chicken Taco Salad Stuffed Avocado Recipe you’ll love some of my other favorite taco dinners! 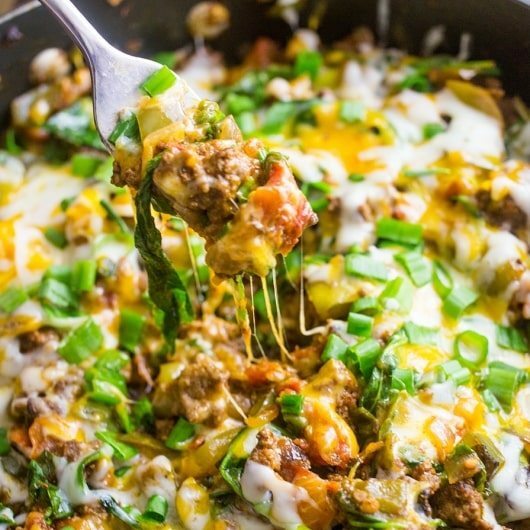 And one of the top recipes on my site of all time – my Cheesy Taco Skillet – which is also low carb, keto, and paleo compatible – or just a tasty filling for tacos and burritos! 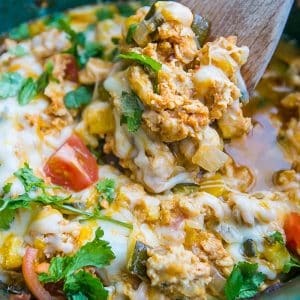 Plus it is deceptively sneaky – I LOAD it up with veggies you’d have no idea are there! Use a very ripe avocado. Pre-cook chicken and let cool. Don’t open avocado until ready to eat. For the most even flavor, remove avocado from peel, and cut into 1″ cubes, mix with taco skillet, and refill back into peel. Knife sharp enough to dice chicken and slice vegetables, that is long and heavy enough to put into avocado pit to remove it from avocado. Easy way to remove avocado from pit and add to chicken tacos. Spoon can be used, but using an avocado slicer will create more even, easy sliced avocado. If you’re following a strict low carb diet, or want to use your own taco seasoning, you’ll use 2 tbsp of your favorite taco seasoning. If using a pre-packaged taco seasoning pouch, one pouch is about 2 tbsp. For the best pan fried chicken breasts for your chicken tacos, chicken should cook quickly at a high temperature. 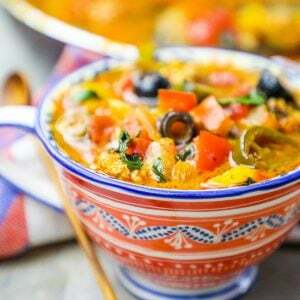 To get juicy chicken with lovely browning, use a large pan that won’t be crowded when adding chicken and vegetables to it – crowding your pan will cause the chicken and vegetables to boil rather than fry. If you love this cheesy chicken taco salad stuffed recipe as much as I do, please write a five star review, and be sure to help me share on facebook and pinterest! In a large pan, heat olive oil until shimmery. Add chicken to pan and cook on high heat, stirring occasionally, until browned - about 8 minutes. Add peppers and onions to pan, cook until lightly browned and soft. When peppers and onions are softened, add taco seasoning and water, mix well. Let water absorb and reduce, then remove from heat. Halve avocado and remove pit. Scoop 1/2 cup taco skillet mixture into each 1/2 avocado. Add arugula to the top, followed by cheese. If taking to work, wrap with foil and refrigerate until ready to microwave, then microwave for 45-55 seconds, until meat is warmed and cheese has melted. Garnish with fresh pico de gallo, serve immediately.